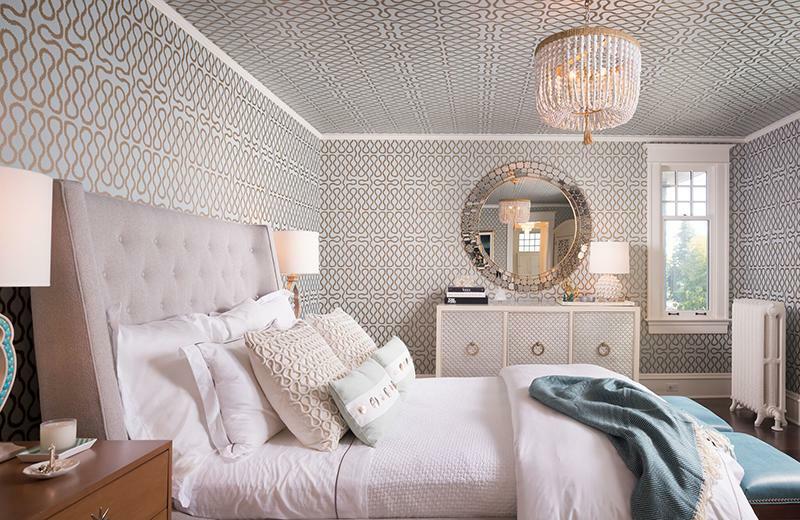 Pattern can understandably be a daunting commitment, particularly when it comes to a decor element as permanent as wallcoverings. What’s the best way to incorporate pattern? How can multiple patterns be successfully mixed with one another? Known for creating hip and stylish spaces that feel personalized and ready to be lived in, we turned to Pulp Design Studios to ask founders Beth Dotolo and Carolina Gentry for their take on the subject and received some key advice in return. 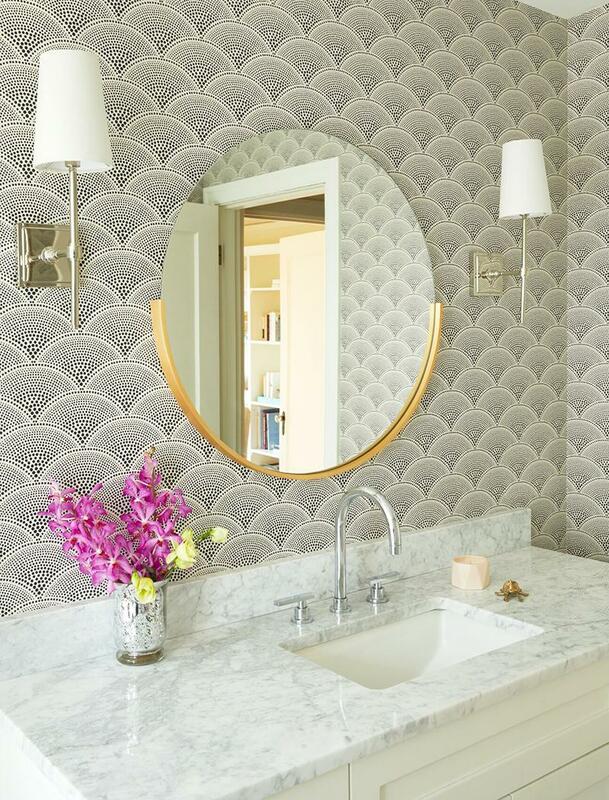 When starting a room’s design with a wallcovering pattern in mind, how do you build off of it? If we start with a pattern that has multiple colors, we use that as a key piece to tie the entire palette together. It’s important to look at ways to both complement and contrast the shapes of a pattern. If it’s highly geometric, mix in some organic patterns to soften the space and create movement, and vise versa. Adding in additional solids or smaller patterns that coordinate with the starting piece will help make the room’s design feel both dynamic and cohesive. What’s your number one rule for mixing patterns? As designers, we like to approach mixing patterns with no rules. We design spaces for our clients that are unexpected, fearless and hip, but it really does take a trained design eye to create the right balance between the scale and color of all the patterns in the mix. In terms of pattern, what can be viewed as a universal neutral? Herringbone! It’s a neutral in fabric, wood, stone and tile, and can be large or small scale, but is always a classic. What’s the most unexpected place you’ve ever found inspiration for a good pattern design? The Eye of Ra pattern from our entertaining goods collection, Kismet Lounge, was actually inspired by this stunning MC Escher style tile that we saw on the floor of a Venetian church on some of our design travels. We wanted to add something figurative so we designed an eye pattern that was conceptualized off the style of the tile. What’s your favorite way to use pattern in a commercial space? Wallcovering is one of our favorite ways to make a big impact in a commercial space. A statement pattern is an easy way to make a space feel high-style and is an opportunity to be bold and innovative. When selected appropriately, wallcoverings can be highly cleanable which makes them a really sustainable option for commercial spaces… we use them a ton in residential design, as well! 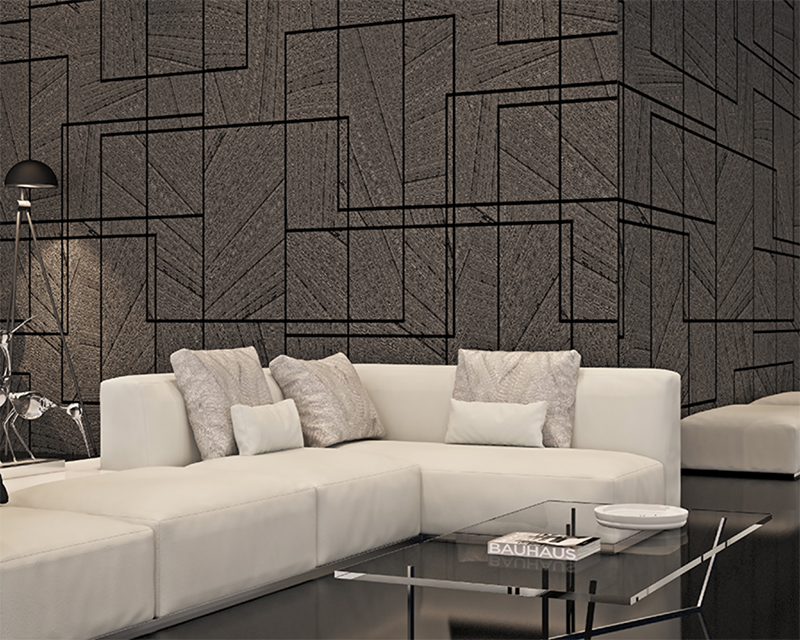 Luxe Surfaces’ wallcoverings gallery offers a wide array of pattern options, from clean and modern to intricate and traditional, that work great in both residential and commercial spaces. Check them out for some inspiration on your next project! 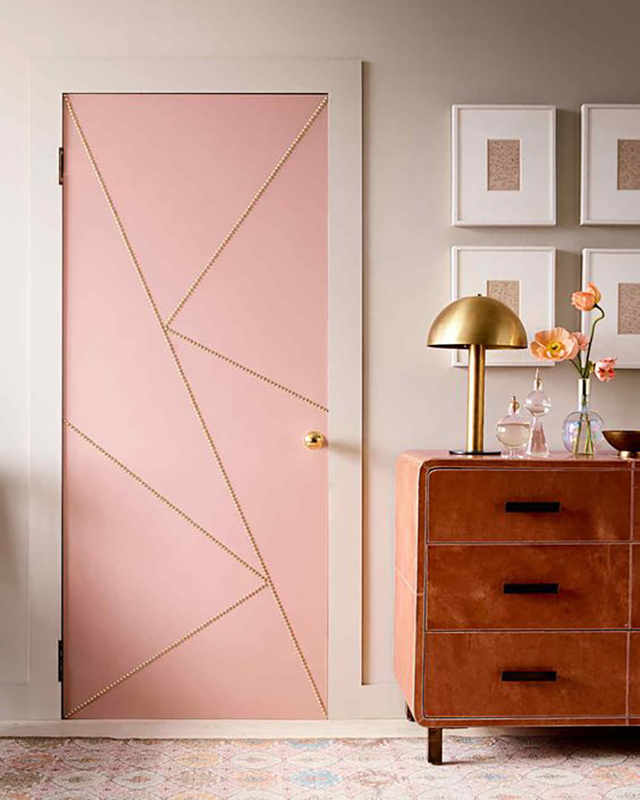 We’re barely into the new year, but 2018’s color trends have been making themselves known for the past few months. 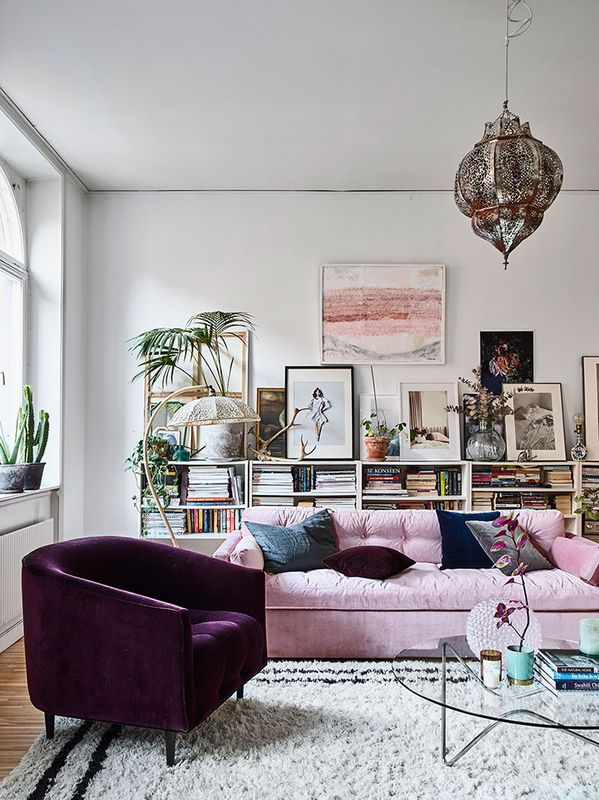 From an intense purple to a serene blue-green, paint companies and color experts have laid out the trends they predict are heading our way in the coming months. 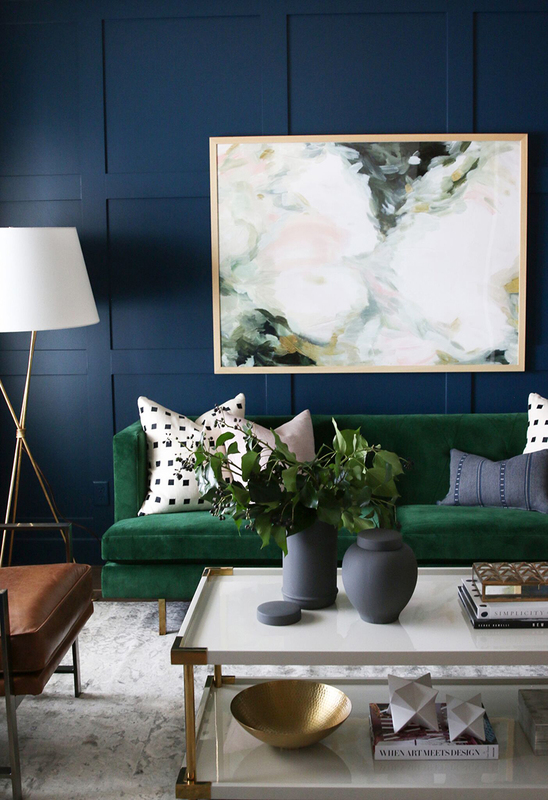 The real challenge here is making these bold hues work for you, and the best way to do that is by leaning on neutrals to both minimize their intensity as well as show them off! 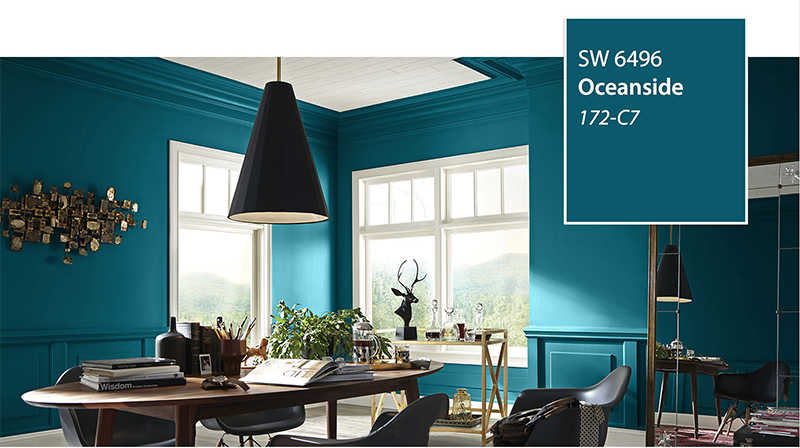 First up is Sherwin-Williams’ 2018 Color of the Year, a deep and moody shade called Oceanside. This blue feels reminiscent of seaside escapes and folklore art, equal parts accessible and elusive, and a great way to bring a sense of adventure into a space. Yet Oceanside also feels cocoon-like, safe and comforting, willing to work with both traditional and modern decor. Pair it with crisp white moldings or neutral textures like Luxe Surface’s Brignac in Maxim. 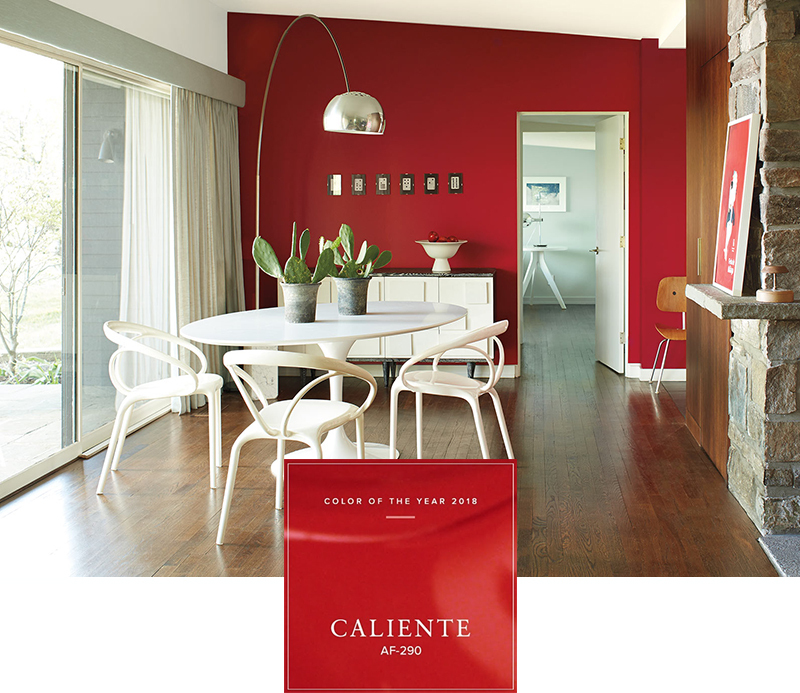 It may not be possible to go any bolder than Benjamin Moore’s Color of the Year – Caliente! If you want to let 2018 know who’s boss, look no further than this strong and radiant color that’s bursting with energy. 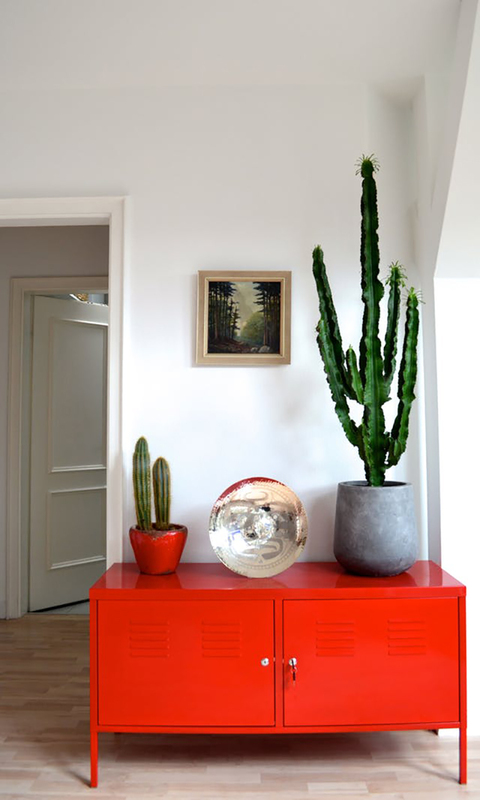 Reds are difficult to ignore and can bring great depth to a space while showing off loads confidence and personality. This particular hue would pair exceptionally well with weathered woods and neutral greys. 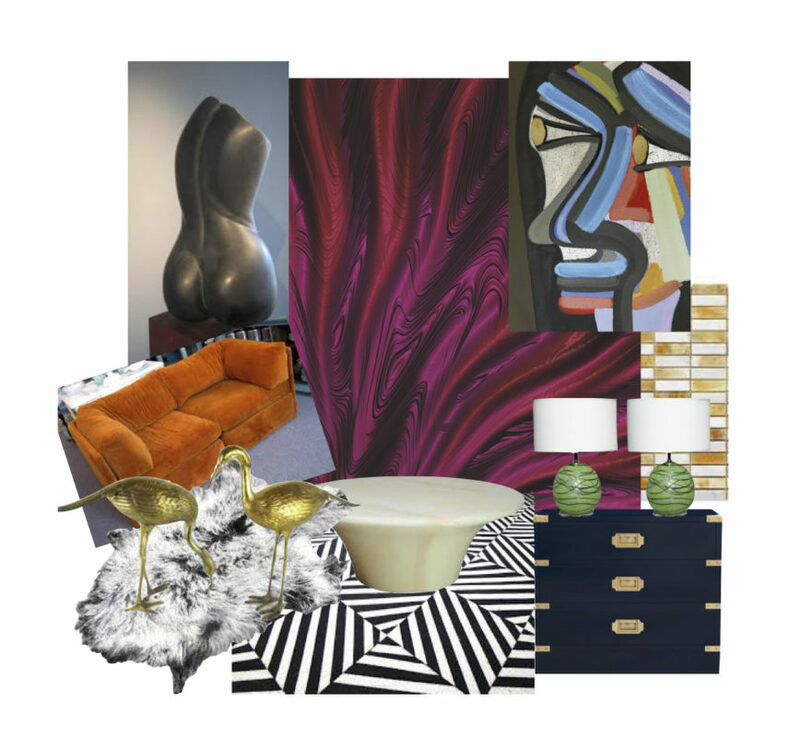 For a modern take on texture, have a look at Patty Madden’s Pravenzo. 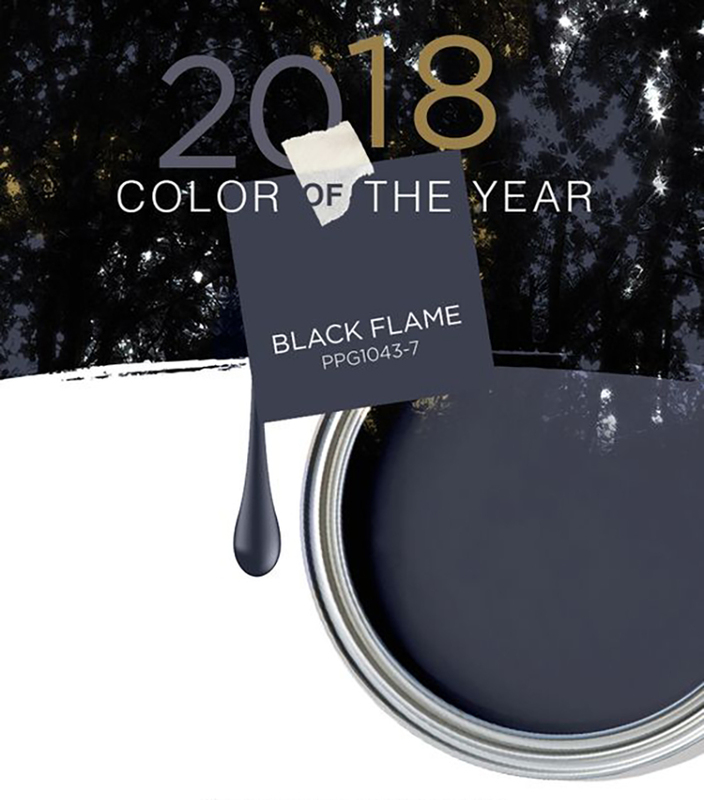 If dark and dramatic is what your decor loving heart desires, consider PPG Paints’ Paint Color of the Year, Black Flame. This may be the least surprising pick in this group, given the rising trend of black walls over the past year. A soft black and navy hue like this allows everything else within its presence to shine, acting as a backdrop and canvas. It brings a cozy sort of silence that allows the rest of the world to melt away. Look to partner Black Flame with blush pinks and other pastels for a hopeful effect, like Patty Madden’s Paeonia digital wallcovering. 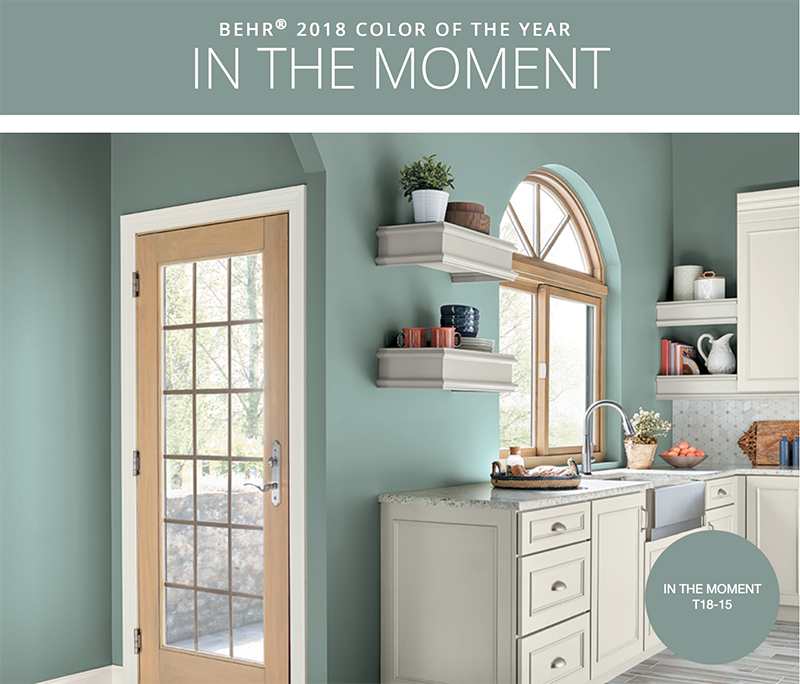 While a lot of color predictions for the year lean in the bold and dramatic direction, Behr’s 2018 Color of the Year is soft and understated in the form of a pale blue/green/grey called In the Moment . 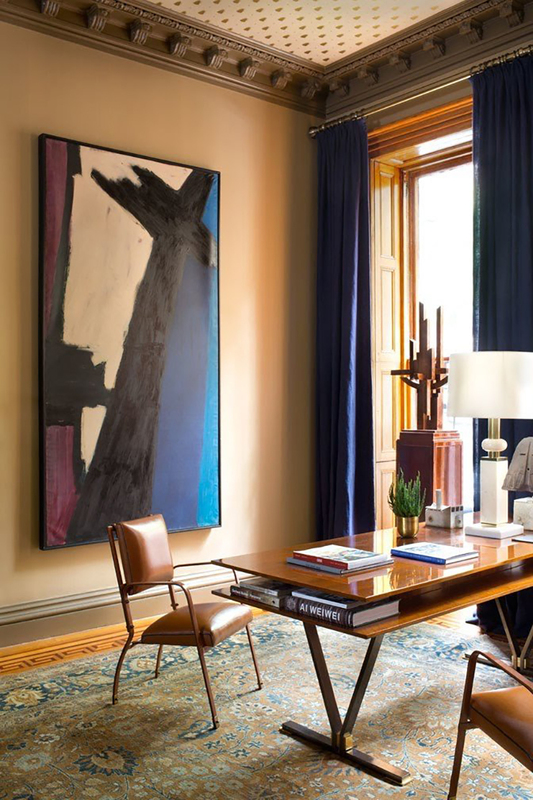 It’s a very serene, yet deep, color that could happily reside in just about any given space. The color is inspired by nature and tranquility, something many of us are looking to add more of to our lives as we strive to be more present and mindful. Pair In the Moment with light wood tones and deeper blues for the ultimate in relaxation, like Beretta in Florence. Last, but most certainly not least, is Pantone’s Color of the Year 2018 – Ultra Violet . 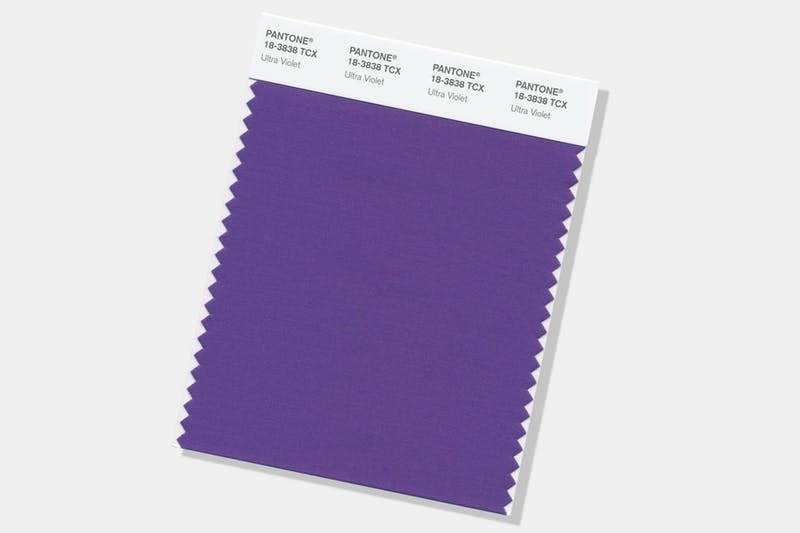 A bold hue that brings to mind royalty, inventiveness, and imagination, this blue-based purple practically begs for artistic brilliance and creativity. And those who dare go there will no doubt find it in spades. To keep the drama level up without taking it over the top, pair Ultra Violet with a metallic-like neutral such as Calvato in Quartz. 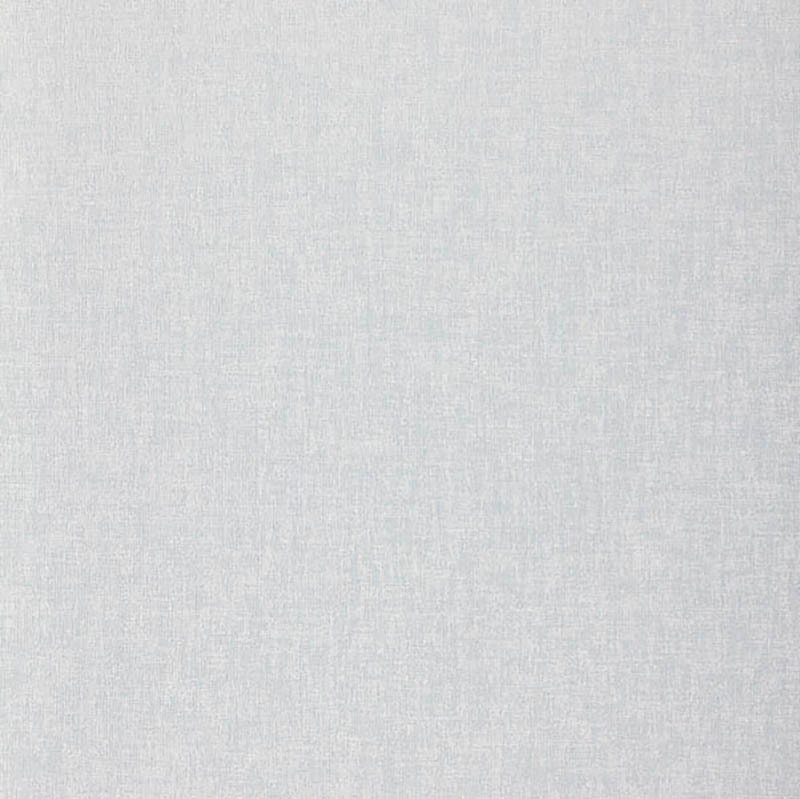 Check out all of Luxe Surface’s wallcoverings for on trend color choices and color pairings! Color is an incredibly powerful force in our lives, but have you ever stopped to think about why that is? One of its strongest abilities is the way in which it can affect our moods and set the tone for a space. Some colors are calming while others are energizing or even intrusive, and others are best used when kept in check with another. 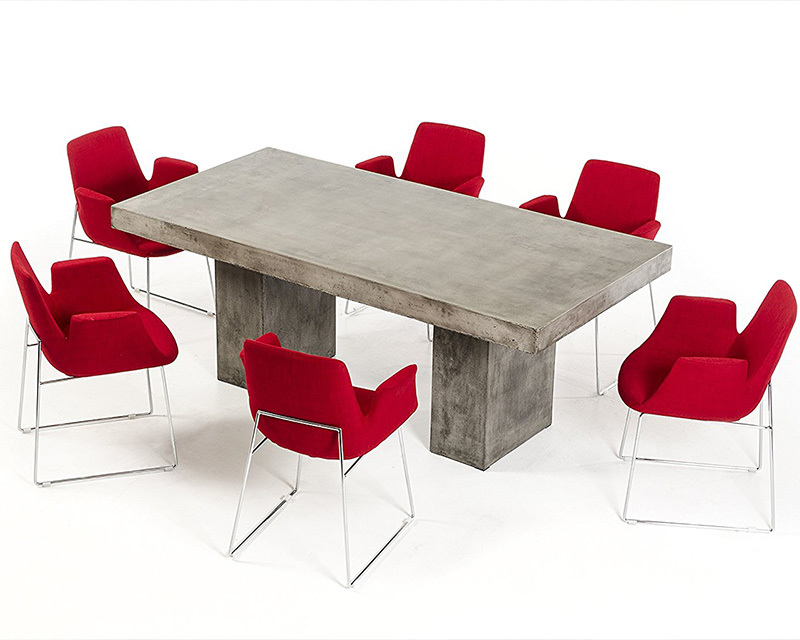 Concrete is one of the only materials that has the ability to be both industrial and chic at the same time. If you want a look of modern industrialism, it’s a surefire way to go – especially right now because it’s trending all over the place. 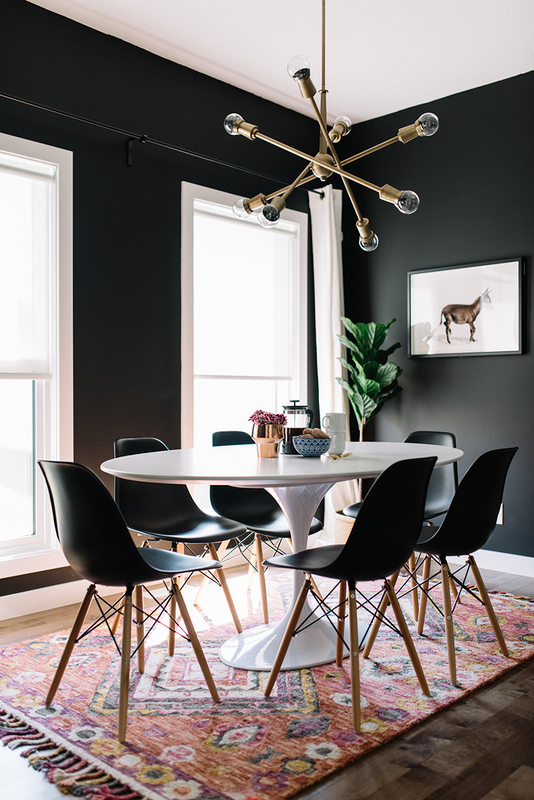 Your first inclination may not be to hang such a weighty material from the ceiling, but that’s exactly what we would do with a show-stopping light fixture like this one picture above. There’s something unexpected about it that draws the eye straight up and holds it there, giving you a great piece to center the rest of the room around. 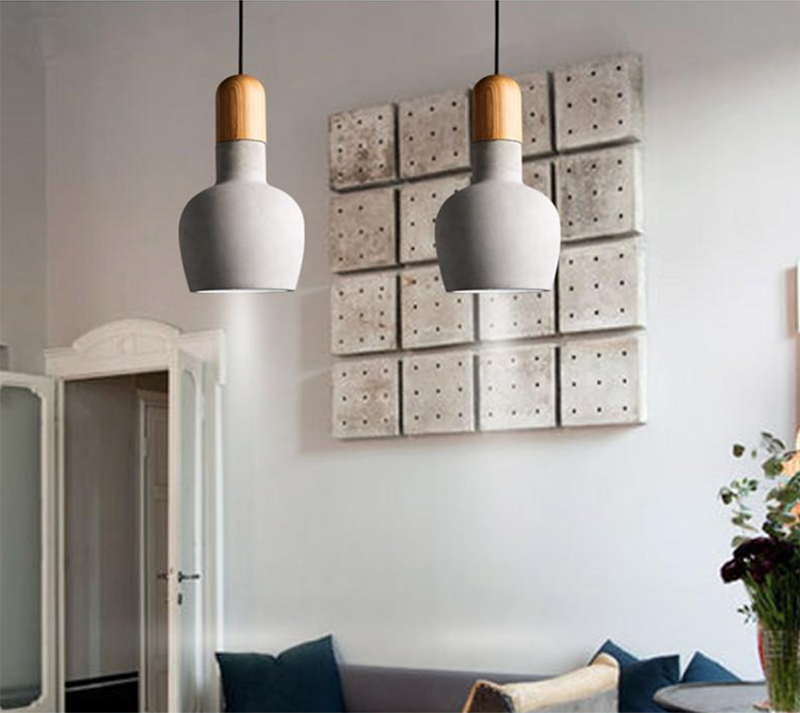 There are plenty of concrete lighting options to choose from, some with a lighter feel to them than others. The beauty above is offered in three different finishes that bring out varying personalities of the material, and would look great alone or in a grouping of several. If you’re all in on concrete let’s take it in the other direction entirely: floors. Concrete floors often get a bad rap because they’re so synonymous with commercial spaces. 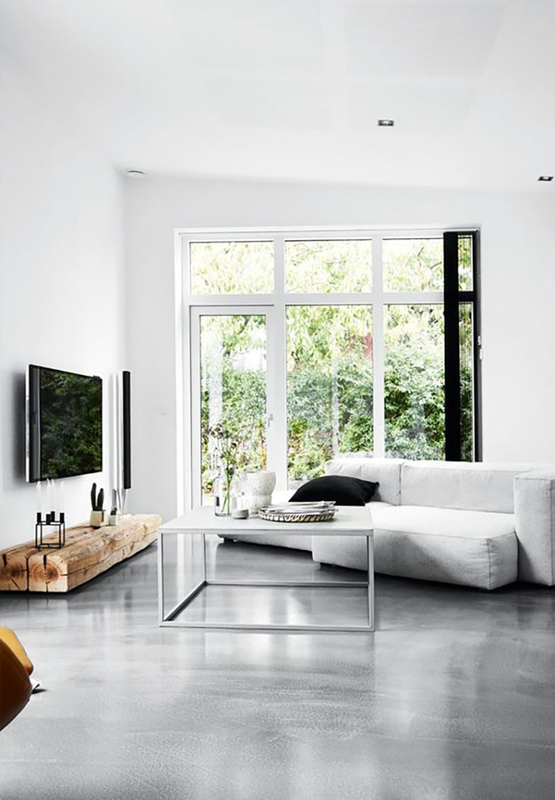 But done the right way, in the right space, with the right aesthetic, a concrete floor can pack a punch in a home. In the past few years treatments like stencils, stamps, polishes, acid stains, dyes, paints, and more have been making themselves known and giving the once common flooring a bevy of new looks. And don’t forget how easy concrete is to keep clean, nearly every mess can be picked up easily. The beauty of concrete furniture is that once it has been sealed you can leave it indoors or move it outside. 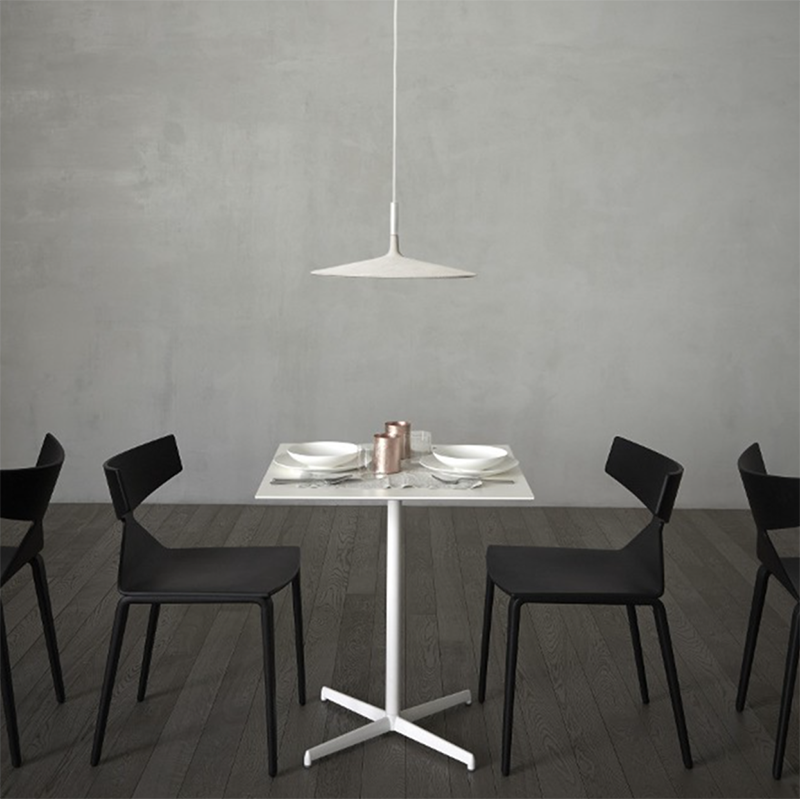 The clean lines of a minimalistic dining table gives you the freedom of changing out dining chairs as well as the rest of the room while anchoring it with a substantial piece of furniture that’s timeless. Even if modern isn’t your preferred look, there are plenty of ways to work concrete into your home. For example, an incredible sink that you can build an entire kitchen around. A piece like this would look equally at place in a sparse loft or country farmhouse, it’s all about what’s added to the rest of the room that determines the overall aesthetic. If you’re not already sold on the concrete trend, let’s explore how to incorporate it on a smaller scale. 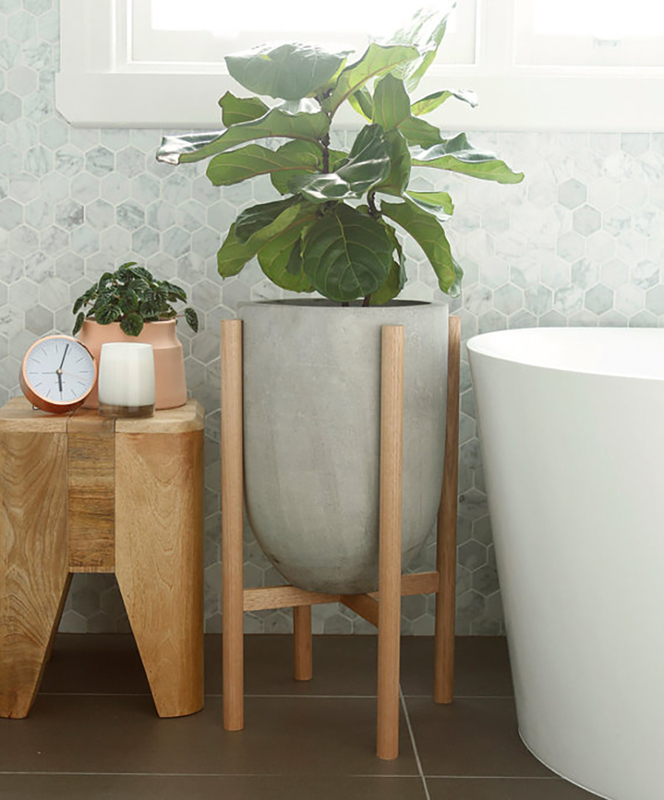 Concrete planters are nothing new, but when brought indoors they take on a whole new flavor that lends itself exceptionally well to mid-century modern design — the definition of form meeting function. Add a touch of concrete with purpose to your home or office with a sleek wall clock. 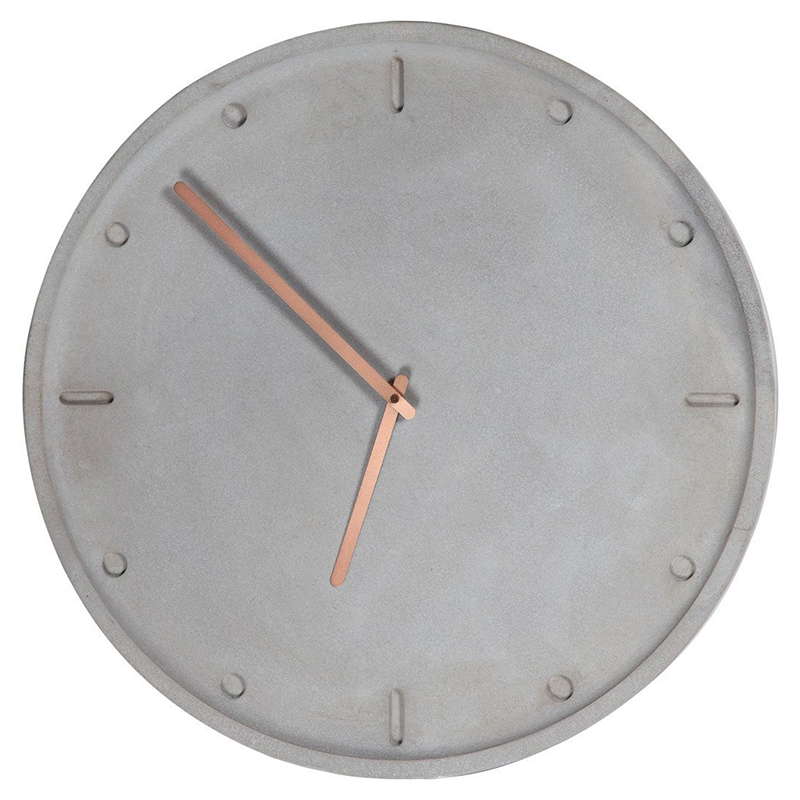 Check out how well the copper accents mesh with the concrete in this modern concrete clock. It warms up that iconic cool grey hue, a tip to keep in mind when decorating with the material in any capacity if you’re intimidated by its sterility. If that’s still too much for your taste, consider even smaller accessories like a set of coasters. If you tire of them being on the coffee table think outside the box and use one as a soap dish in the bathroom or to hold your kitchen sponge when not in use. 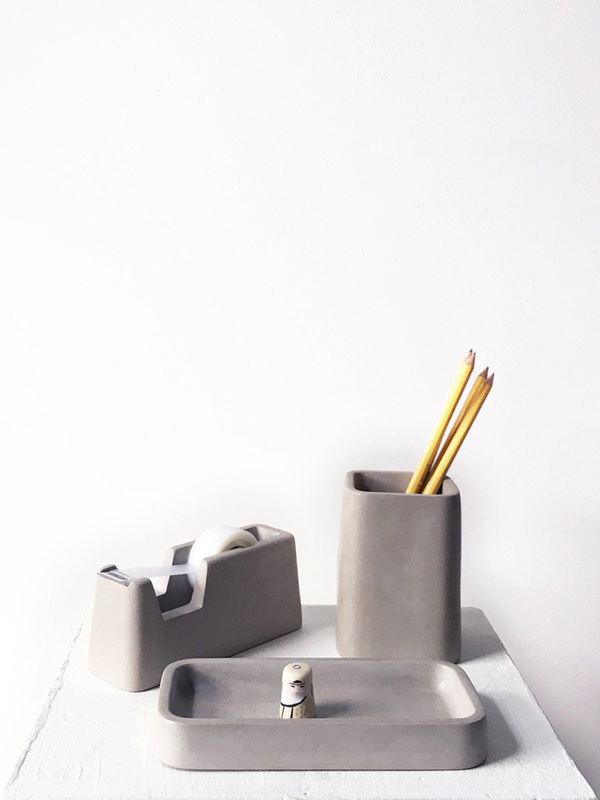 This tidy concrete desk set has such clean, crisp lines that it’s sure to keep your work life just as shipshape. Or use it at home to corral an unruly kitchen or craft room corner, because this is one trend that’s able to find a place in nearly every space. 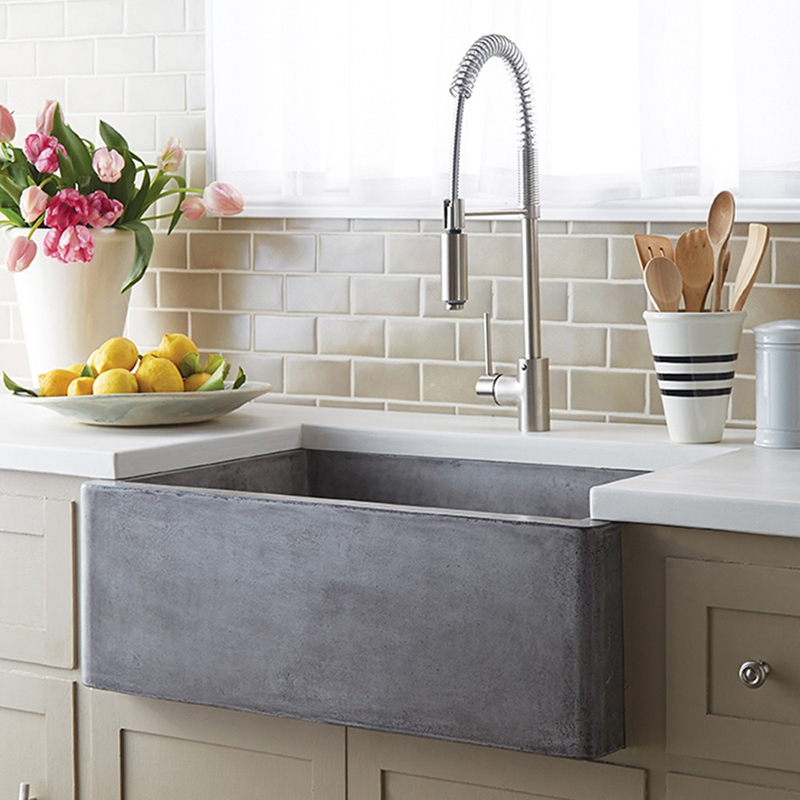 Luxe Surfaces offers up the perfect way to take the concrete trend vertical. The Ashlar pattern in particular mimics all of the qualities we love about actual concrete while adding an intricate pattern of simple lines to the mix. Available in five different colorways, this is a great option for bringing the trend into your space in an especially unique way. Share with us how you’ve incorporated concrete into your home or a recent client design. Drawing inspiration from personal experience, Patty translates life’s many facets onto proprietary “canvases” meant to be shared and discussed with others. Whether this “public forum” is a private residence or commercial property, Patty’s digital wallcovering is immediately engaging. 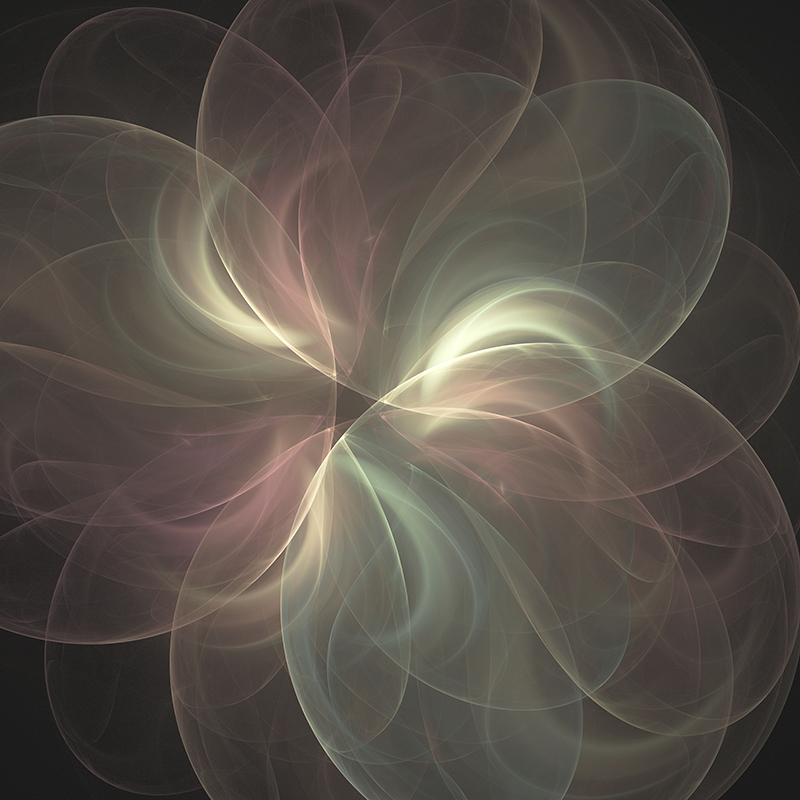 Digitally rendered, the designs are stimulating, unanticipated and yet strangely familiar. Patty’s artwork unites us through shared emotion, stimulates our senses, and reminds us of a common human experience…in a very uncommon way. The designs are powerful. Highly individualistic. Spiritual. The final product onto which they are rendered…equally so. This re-imagination of material has captured the attention of Luxe Surfaces, who together with Patty Madden, have long been aware of the import of wall space. So how do you experience your walls? Are they necessary fundamentals holding up your roof? A place for your ceiling to rest? Or does the idea of art beyond the frame appeal to you? 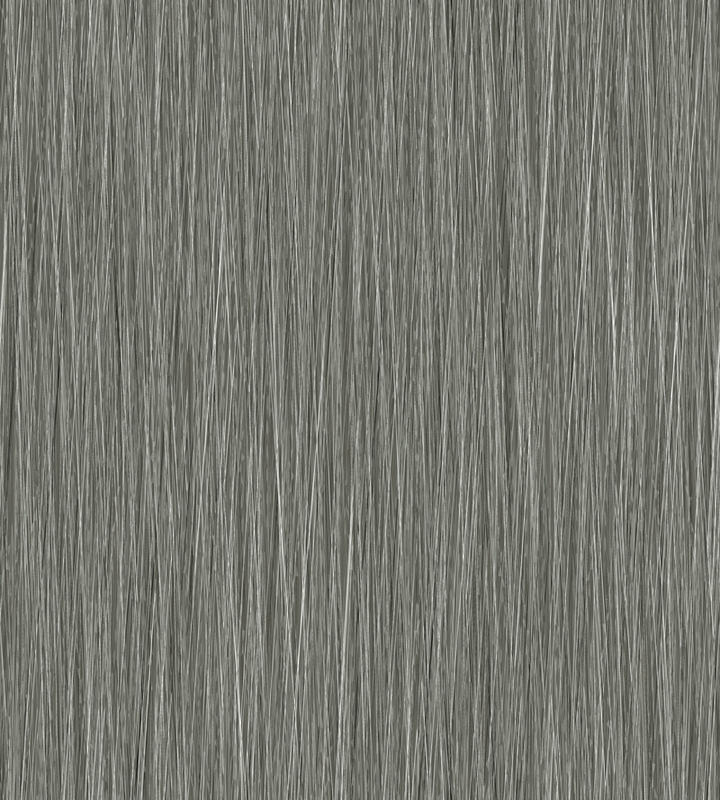 In the Patty Madden Digital Wallcovering collection, we market our product primarily on vinyl and mylar grounds. However, colour, scale, and grounds (vinyl, mylar, acrylic, wood veneer), can all be easily substituted and customized. No longer limited by the pairing of design components – pioneering product developer – Patty Madden – makes unimaginable artistic possibilities for vertical space a reality. Our tenacious desire for something “new” has met its match with the digital evolution of surface artistry. Today the onlooker joins forces to co-create with the artist. 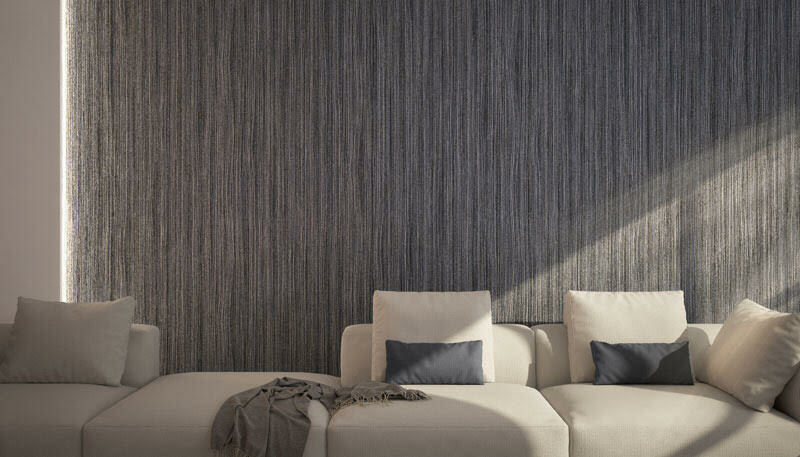 The digital wallcovering ‘Zephyr‘ is a perfect example. A fascinating design, replete with old world ornamentation, Patty has reinterpreted the motifs with modern clarity and crisp contour. A mylar ground would make your space luminous, but print the design on acrylic paneling affixed to your walls evokes a sense of gallery-like interiors. The results are endless and always breathtaking. Luxe Surfaces. Offering you a completely new way to “experience” your walls. 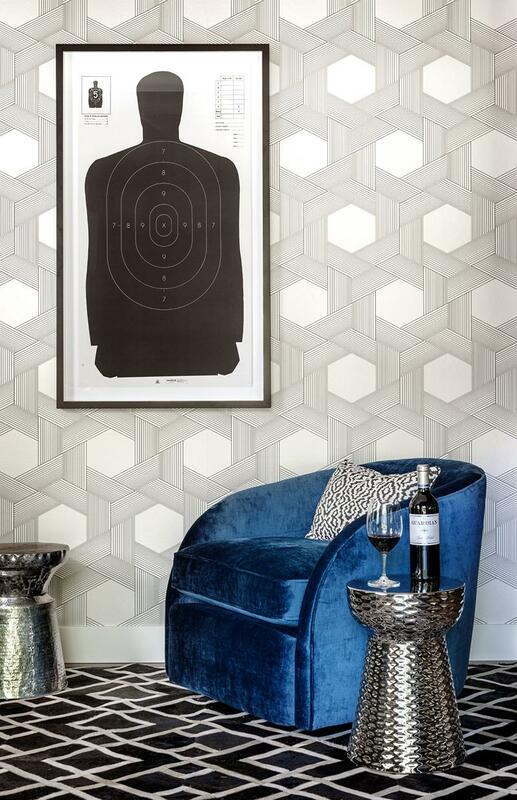 It’s hard to miss the resurgent popularity of geometrics in interior design and easy to be intimidated by its adept use on fashion runways and popular architectural magazines. When applied correctly, however, today’s geometrics are a fantastic and easy way to give your interior spaces an elegant, thoroughly modern look. Here’s a few pointers to help you get started. 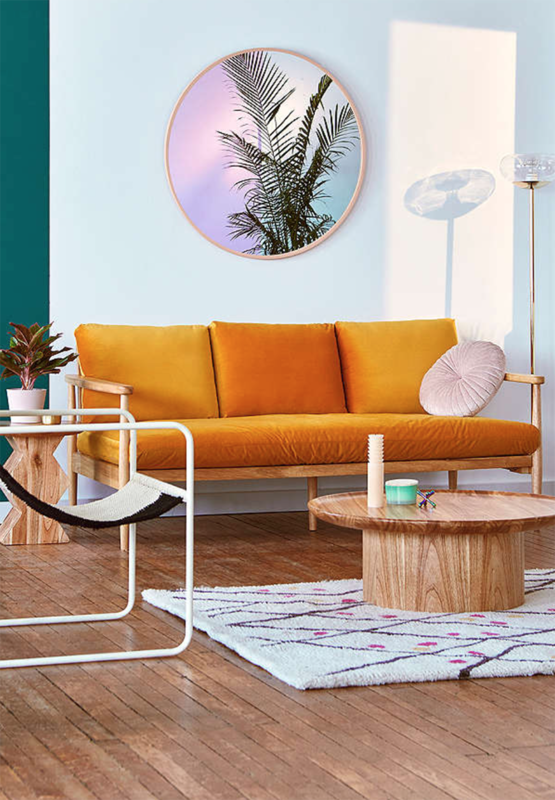 LESS IS MORE If we’ve learned anything from the cyclical waves of fashion trends over the years, it’s the appreciation that “less is – typically – more.” That, and a growing appreciation of design inspo from Mother Nature, mean old favs are reborn in fresh and contemporary ways. Just remember KISS… and I’m not talking about the band. 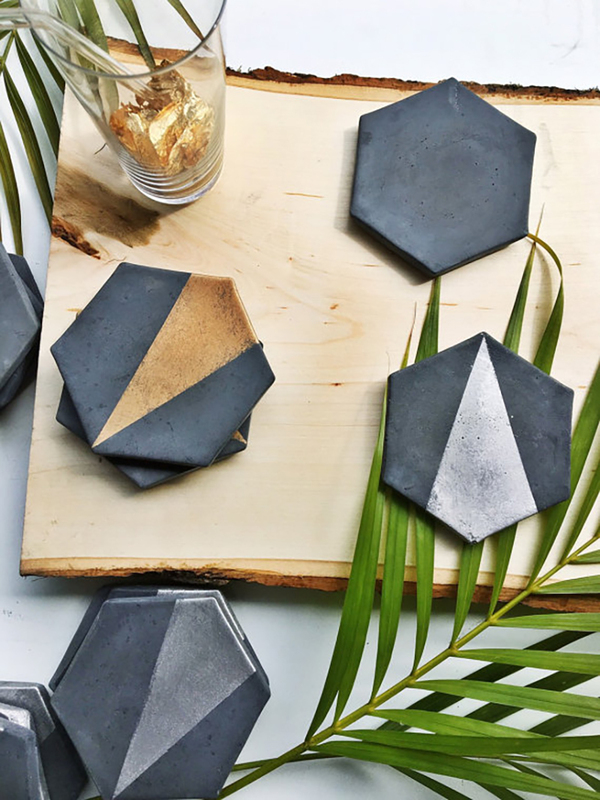 DON’T LOSE YOUR BALANCE The new geometric aesthetique, while paying homage to its past, melds geometric design with earth-friendly, thought provoking new materials = a totally new type of groovy. No offense, 70’s! Balance out the straight lines and shapes of geometrics with classic shapes and natural elements for interest. COLOUR YOUR WORLD In contrast to their more traditional counterparts, today’s geometrics are larger and more simplistic – giving us the “space” we need to breathe and relax amidst our busy lives. The profound visual interest piqued by larger scale design is further enhanced with saturated earthen hues that are restful, “solid” and inviting. Geometrics, in a foundational colour palette or neutral, will direct your selection of accent pieces and art. LOVE YOUR CURVES Keep your interiors from looking too rigid by embracing your curves… circles or waves in a floor rug (think zebra! ), pillows or curtains. Unless you are into uber contemporary, this is an important step in your design maturity. SIZE YOU UP Larger geometric patterns do well to be paired with other patterns that are the next largest or smallest in size to the geometric. This way, you avoid one piece completely overshadowing the other. Though “one of these is not like the other” they end up looking born for each other. 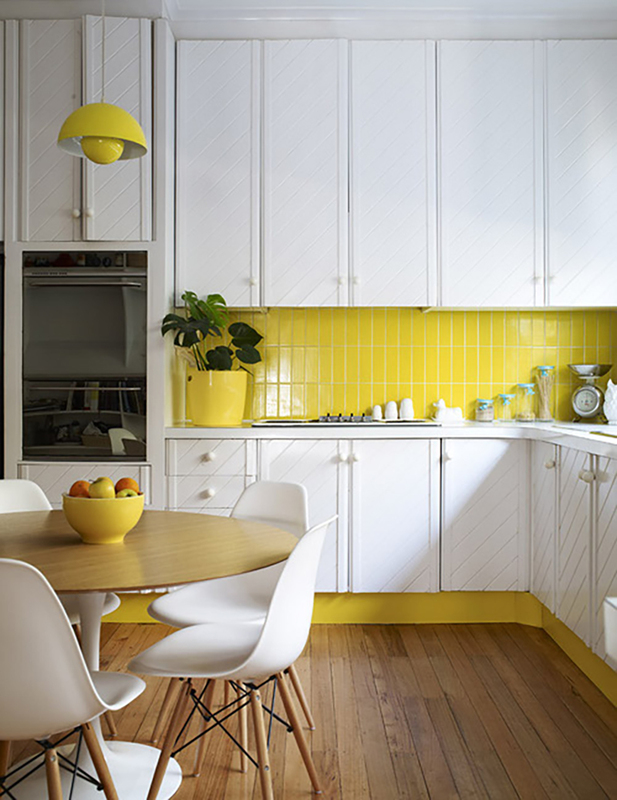 Colour – Utilize different shades of one color in conjunction with complimentary hues (get a colour wheel). 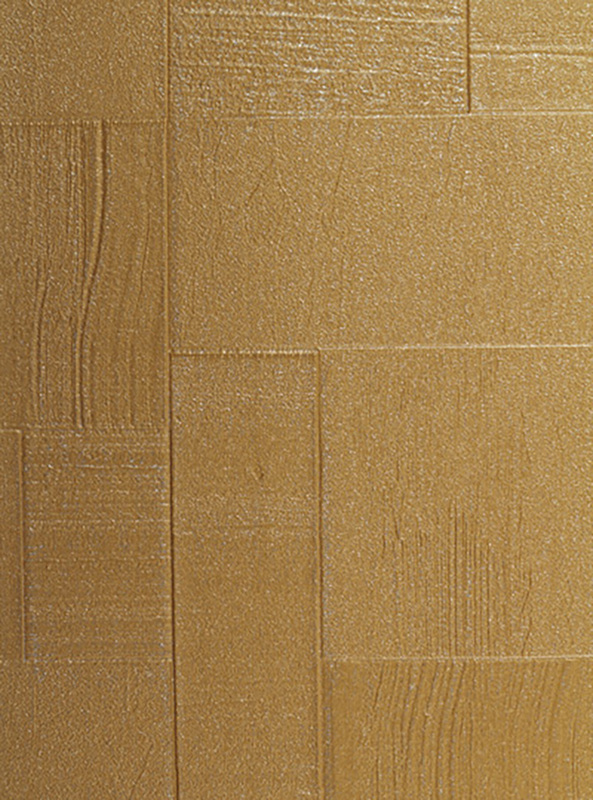 Texture – keep it interesting! 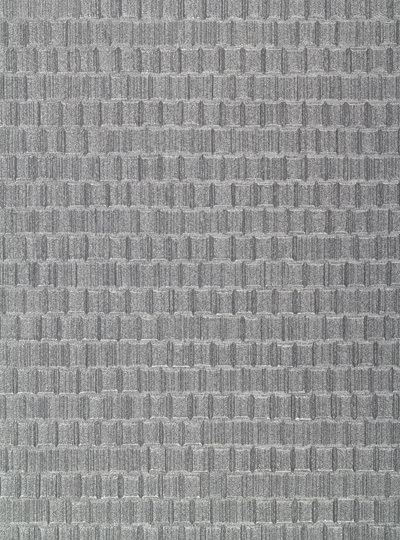 Work natural wovens, metals and earth inspired pattern, alongside your geometric. Scale – keep the size of each your patterns different (think small, medium, large) and pick one from each grouping. Giving your eye somewhere to “rest” in your space is essential to keep your space from looking “overworked,” overthought, and busy. Inspired by an Incan wall in Machu Picchu, Patty has captured all the decorating tenants discussed above in Ashlar. Visit our site by clicking this link to explore. Interestingly, in some Masonic groupings, ashlars are used as a symbolic metaphor for progress. Ever loved a piece of art so much you wished it was infinitely larger encompassing your entire space with its colour, movement, and emotion? Now you can. 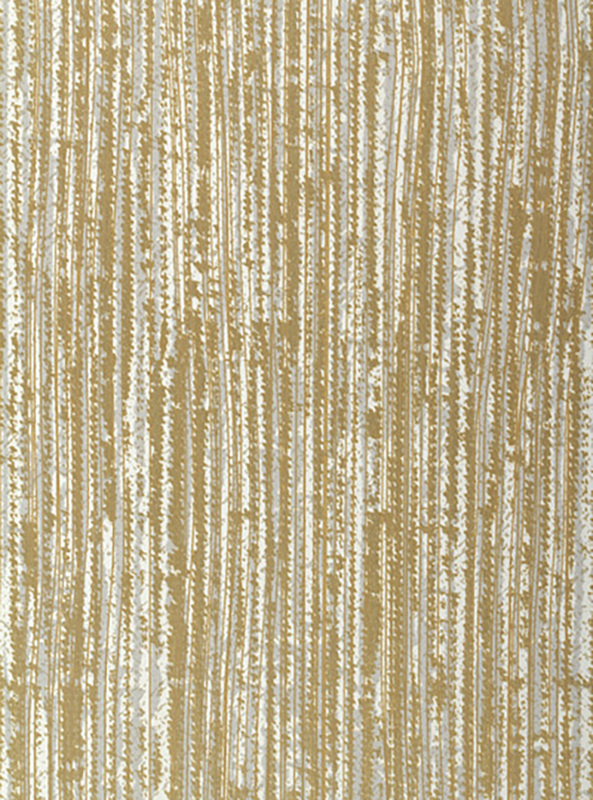 Luxe Surfaces is pleased to introduce Patty Madden Digital Wallcovering. Patty combines proprietary printing technology and substrates with design artwork to suit everyone’s taste – from nature-inspired organics and botanicals, to vortex imagery and geometrics – Patty’s designs unleash the imagination. ‘Nest’ is the perfect example. Click on the link to explore it colourways and details up close. Nest’s portrayal of nature’s stunning, asymmetrical haven captures the beauty of woven, sculpted filaments, grass and feathers. Securely anchored within protective boughs, silken spiderwebs provide an ethereal softness that makes you want to crawl within its sanctuary. That’s the beauty of Patty’s digital artistry. Colour, scale and the very ground or substrate upon which your art is printed can be adjusted to match what you see in your mind’s eye. Rendered in browns, greens, cream and grey – Nest will get you “feathering.” But change the artwork to the blue colour scheme and immediately you’re transported 20,000 Leagues Under the Sea! If you’re like me, you’ll appreciate the difference a colour can make (greys, anyone?!?). See for yourself! 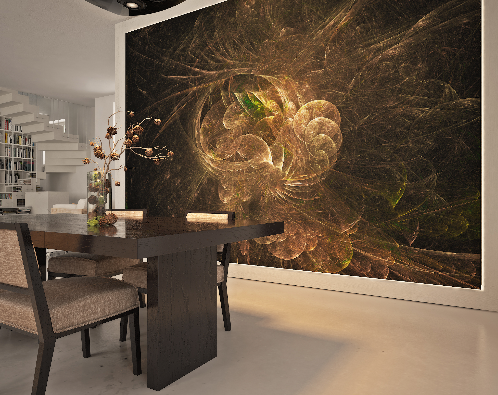 Imagine limitless possibilities with digital wallcovering by Luxe Surfaces and Patty Madden. 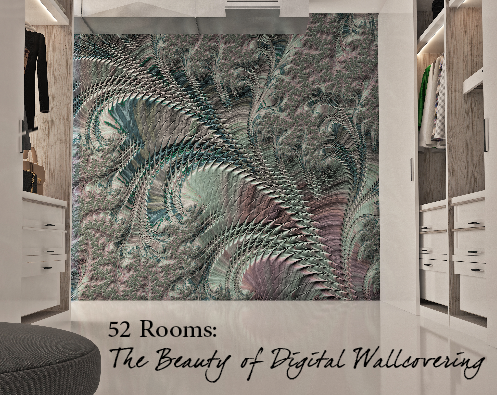 Digital wallcovering adds depth and dimension in a way that feels very couture and lavish but can be created and installed to fit any budget in a remarkable timeframe. The innovation and freedom to design and adapt is endless, allowing for one-of-a-kind works of art for your wall. Go ahead. Unleash your imagination and free your art from the frame. Interior designers create spaces that support us, make us feel good, cheer us or simply cause us to “chill.” They understand our spaces define us – how we live, work and play. They give us a sense of being, we input our sense of personhood into them and valued items of belonging. 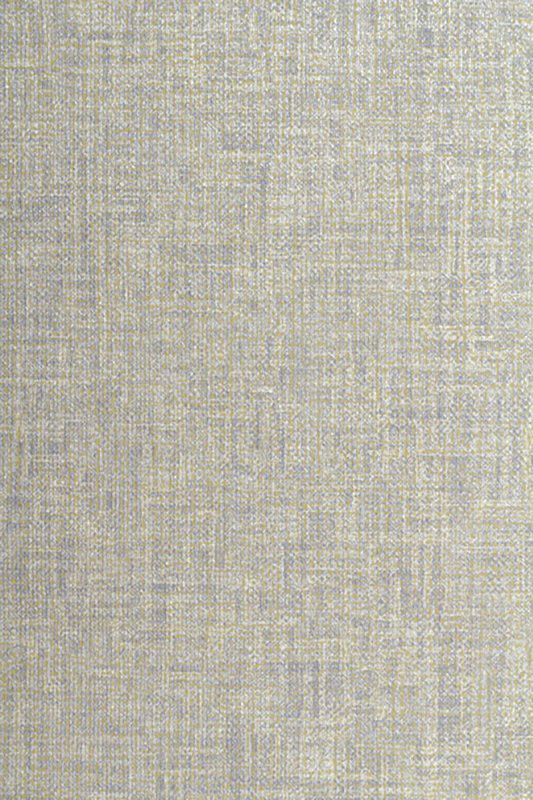 Luxe Surfaces has partnered with Patty Madden and created a wallcovering product that “taps into” this very important essence of our being: the desire for beauty and order in our surroundings. Patty incorporates unique design on proprietary grounds that “birth” life out of the interplay between texture and colour. One such example is ‘Solace.’ Myth tells of a great tree growing at the center of the universe – branches piercing through human affairs; boughs upholding the firmament with its stars and planets, roots anchored in the eternal soil of time. Patty Madden lyrically captures the flow of wisdom, knowledge, and truth through an intricate, vascular system that channels life into the evolution of the human family. The design’s subtle metallic ground illuminates interior space painting liquid warmth over every surface. Available in five different colourways, the inclusivity of the design ‘Solace’ draws you in to a space you never want to leave; a space that is anchored in your heart no matter where your travels take you. 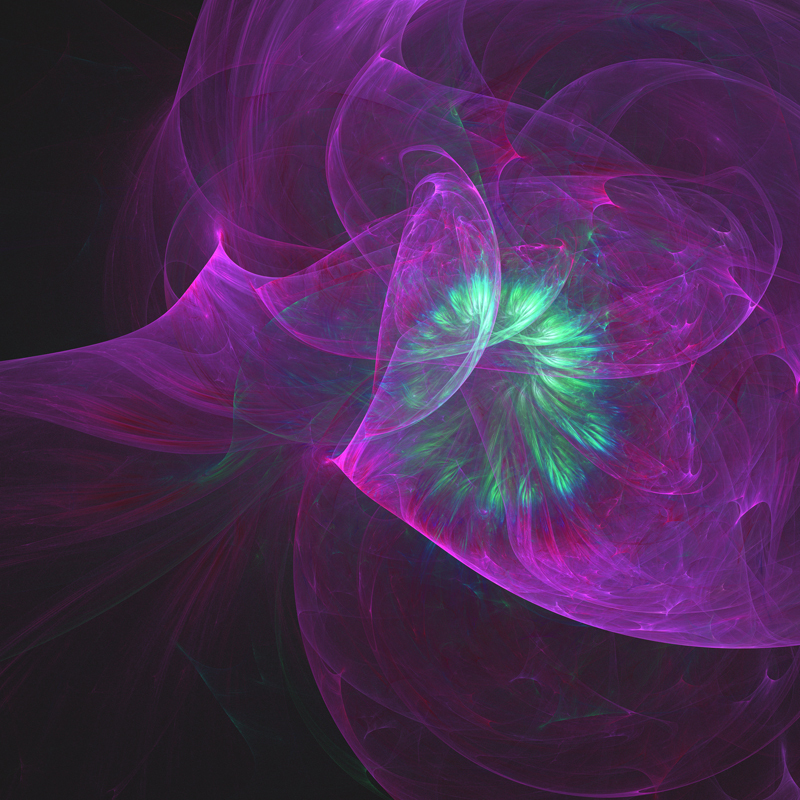 Molecules “dance” with the introduction of energy and forms morph. Solid to liquid. Though temperatures rise, ‘Melt’ likes it HOT! As though freed from a fixed shape, Patty’s charred hues and glistening golds capture the beauty of heat-induced fragments of digital viscosity. ‘Melt’ can be scaled to fit your preference. Patty has made the design available in four colorways, but color can be changed easily to suit your setting. 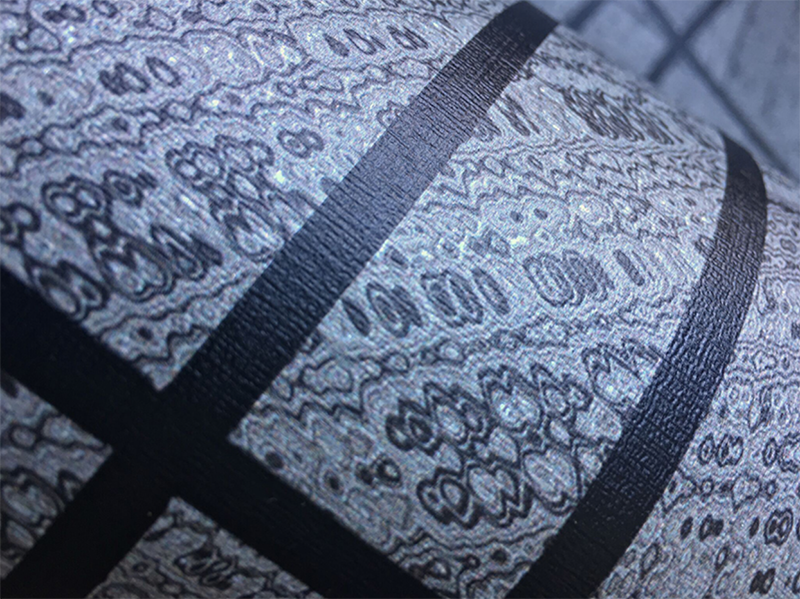 Create ‘Melt’ on various grounds that range from vinyl and proprietary mylar, to veneer, metal and clear film. Though shown in a bedroom, anywhere you use ‘Melt’ is sure to make the sparks fly! Patty Madden’s digitally created designs invoke a visual tension between earthy naturalism and man-made elements, the masculine and feminine, modern and vintage. Alongside its curiosity comes a flexible design ethos that works beautifully in the discerning space be it residential or commercial. Renown for intriguing design and finish propensity (think Zaza Mylar), Patty’s work is undeniably rock ‘n’ roll gloss double-dipped in high-chroma style. With a certain Hollywood aesthetic, Patty cues up 40’s glamour and serves it up HOT with thoroughly contemporary motifs that lend her work the ever popular ’70s vibe – funky, yet eternally chic. If punches of intense colour cause you pause, monochromatic may be your calling. And don’t worry. Patty, too, likes a repose. A professor of Pantone was once quoted as saying, “Use colour wisely, Grasshopper,” and Luxe Surfaces couldn’t agree more. Want to play Switzerland with your neutrals? 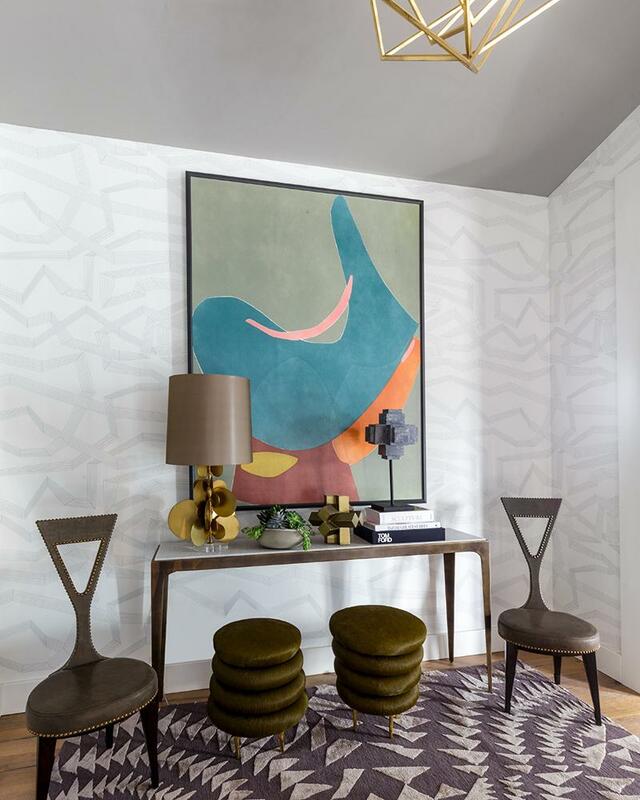 Fine, but don’t let vibrancy of digital pattern scare you away from displaying bold pieces of wall art atop one of Luxe Surface’s more subdued geometrics or grasscloth looks (available here: www.luxesurfaces.com). Not only has Patty made many of her digital wallcovering designs available in calming casts, but the emboldened digital artwork is killer behind a frame. Now that’s double tasking! 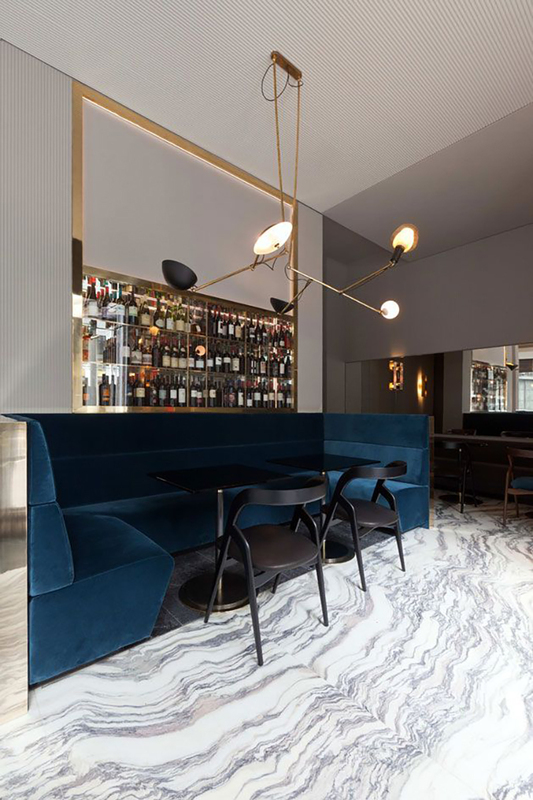 When integrated into spaces that utilize lacquered surfaces, brass, mirrors, gold leaf, statuary and vintage-inspired furniture, you achieve contemporary maximalism. When surroundings are simplified, and the focus on the digitally-designed wall itself, you have contemporary minimalism at its finest. Together with Luxe Surfaces, Patty Madden has succeeded in creating an identifiable look both glamorous and provocative and enduringly appealing. Make your environment memorable with Patty Madden Digital Wallcovering.